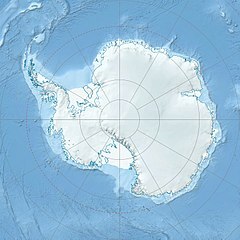 The Wisconsin Range (85°45′S 125°00′W﻿ / ﻿85.750°S 125.000°W﻿ / -85.750; -125.000) is a major mountain range of the Horlick Mountains in Antarctica, comprising the Wisconsin Plateau and numerous glaciers, ridges and peaks bounded by the Reedy Glacier, Shimizu Ice Stream, Horlick Ice Stream and the interior ice plateau. The range was mapped by the USGS from surveys and U.S. Navy air photos, 1959-64. Named by US-ACAN for the University of Wisconsin–Madison, Madison, Wisconsin, which has sent numerous researchers to Antarctica. Most of the upland surface area of the range is the Wisconsin Plateau (85°48′S 125°24′W﻿ / ﻿85.800°S 125.400°W﻿ / -85.800; -125.400), a large ice-capped plain with general elevations above 2,800 metres (9,186 ft). To the east and southeast, the plateau descends gradually and with only minor ice escarpments to merge with the interior ice plateau; to the north and west, the plateau displays abrupt escarpments and cliffs of over 1,000 metres. Mapped by USGS from surveys and U.S. Navy air photos, 1960-64. Named by US-ACAN in association with the Wisconsin Range. Faure Peak is a peak, 3,940 m, standing 3.5 mi E of Mount Minshew along the northern side of Wisconsin Plateau. Mapped by USGS from surveys and U.S. Navy air photos, 1960-64. Named by US-ACAN for Gunter Faure, leader of the Ohio State University geological party to the Horlick Mountains, 1964-65. Koopman Peak is a peak over 2,200 m, standing 2 mi N of Moran Buttress on the northern side of the range. Mapped by USGS from surveys and U.S. Navy air photos, 1960-64. Named by US-ACAN for Kenneth E. Koopman, Navy yeoman on Operation Deep Freeze 1965-67. Mount LeSchack is a distinctive flat-topped mountain standing on the north side of Perkins Canyon. Mapped by USGS from surveys and U.S. Navy air photos, 1959-60. Named by US-ACAN for Leonard A. LeSchack, traverse seismologist, Byrd Station winter party, 1958. Mount Minshew is a prominent, mainly ice-covered mountain with a small exposed summit peak, 3,895 m, standing 3.5 mi W of Faure Peak at the NW extremity of the elevated plateau portion of the range. Mapped by USGS from surveys and U.S. Navy air photos, 1960-64. Named by US-ACAN for Velon H. Minshew, geologist with the Ohio State University geologic party to the Horlick Mountains, 1964-65. Sheets Peak is a peak over 1,800 m, standing 1 mile (1.6 km) northwest of Koopman Peak on the north side of the range. Mapped by USGS from surveys and U.S. Navy air photos, 1960-64. Named by US-ACAN for Joseph D. Sheets, journalist on U.S. Navy Operation Deep Freeze 1965-67. Mount Soyat is a prominent mountain in the western side of the Wisconsin Range, rising on the east side of Reedy Glacier just north of the junction of Norfolk Glacier. Mapped by USGS from surveys and U.S. Navy air photos, 1960-64. Named by US-ACAN for Commander David Soyat, U.S. Navy, air operations officer with Squadron VX-6 at McMurdo Station, winter 1962. Gierloff Nunataks (85°31′S 129°0′W﻿ / ﻿85.517°S 129.000°W﻿ / -85.517; -129.000) is a group of nunataks lying 8 nautical miles (15 km) northwest of Lentz Buttress, at the northern side of the range. Mapped by USGS from surveys and U.S. Navy air photos, 1960-64. Named by US-ACAN after George B. Gierloff, builder, Byrd Station winter party, 1961. Lentz Buttress (85°40′S 127°36′W﻿ / ﻿85.667°S 127.600°W﻿ / -85.667; -127.600) is a prominent rock bluff 5 mi ENE of Faure Peak, rising to 2,800 m and forming a projection along the northern side of the Wisconsin Plateau. Mapped by USGS from surveys and U.S. Navy air photos, 1960-64. Named by US-ACAN for Lieutenant Malcolm W. Lentz, U.S. Navy, officer in charge of the South Pole Station winter party, 1962. Perkins Canyon is a canyon at the head of Quonset Glacier, between Ruseski Buttress and Mount LeSchack, along the northern side of the range. Mapped by USGS from surveys and U.S. Navy air photos, 1959-60. Named by US-ACAN for David M. Perkins, geomagnetist, Byrd Station winter party, 1961. Ruseski Buttress (85°29′S 124°23′W﻿ / ﻿85.483°S 124.383°W﻿ / -85.483; -124.383) is a buttress rock or spur forming the south portal to Perkins Canyon along the northern side of the range. Mapped by USGS from surveys and U.S. Navy air photos, 1959-60. Named for Lieutenant Peter P. Ruseski (MC) U.S. Navy, of the Byrd Station winter party, 1958. ^ a b "Wisconsin Range". Geographic Names Information System. United States Geological Survey. Retrieved 2004-11-03. ^ "Wisconsin Plateau". Geographic Names Information System. United States Geological Survey. Retrieved 2010-06-08. ^ "Faure Peak". Geographic Names Information System. United States Geological Survey. Retrieved 2010-06-08. ^ "Koopman Peak". Geographic Names Information System. United States Geological Survey. Retrieved 2010-06-08. ^ "Mount LeSchack". Geographic Names Information System. United States Geological Survey. Retrieved 2005-11-05. ^ "Mount Minshew". Geographic Names Information System. United States Geological Survey. Retrieved 2010-06-08. ^ "Sheets Peak". Geographic Names Information System. United States Geological Survey. Retrieved 2008-02-01. ^ "Mount Soyat". Geographic Names Information System. United States Geological Survey. Retrieved 2006-05-03. ^ "Gierloff Nunataks". Geographic Names Information System. United States Geological Survey. Retrieved 2009-02-18. ^ "Lentz Buttress". Geographic Names Information System. United States Geological Survey. Retrieved 2010-06-08. ^ "Perkins Canyon". Geographic Names Information System. United States Geological Survey. Retrieved 2010-06-08. ^ "Ruseski Buttress". Geographic Names Information System. United States Geological Survey. Retrieved 2008-08-06. This page was last edited on 22 February 2019, at 20:03 (UTC).